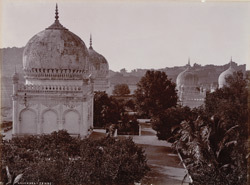 Photograph of the tombs at Golconda in Andhra Pradesh, from the Macnabb Collection (Col James Henry Erskine Reid): Album of Indian views, taken in c.1902-03. Golconda was capital of the Qutb Shah dynasty, founded in 1512 by Quli Shah. Nearly all the members of the dynasty were buried in the complex of royal tombs at Golconda. Each of the tombs in this dynastic necropolis are built in the same tradition as those in Bidar. They are all onion shaped domed structures surmounted on cube bases, with a surrounding arcade and rich ornamental details. Built of local granite and plaster, the construction of each tomb was supervised by each sultan during his lifetime.